baKno is a game development studio based in Florida USA since 2006. We are a group of video game enthusiasts committed to create engaging gaming experiences. baKno develops and distributes casual games for desktop, mobile, VR and console. Players in more than 100 countries enjoy our games on a daily basis. Our titles are provided from our website and popular application stores. When you put on your VR headset your brain gets hacked. Automatically, you feel fully immersed in a Motorbike landscape, surrounded by mountains and the blue sky with cotton clouds, you can hear the wind blowing, birds and waterfalls around. In front of you is the whole track, all obstacles and the rider on the bike, ready to run. Using the keyboard or a gamepad you start controlling the rider the same way you play on the desktop version. Game on!. 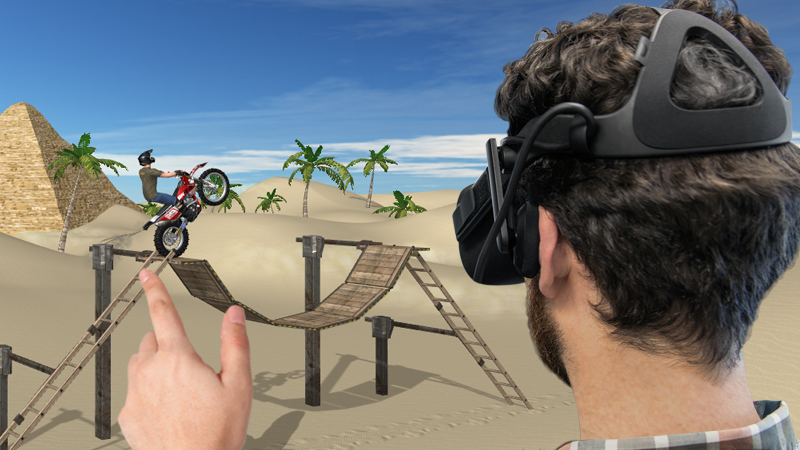 While your main point of view slowly follows the ride, you can still move your head around to check on the environment, the obstacles and the bike from all angles.